Everyone knows what children’s dishware looks like. In fact, you can probably envision that hard, clangy plastic, as we speak—it’s called melamine. Modern dishware for children, however, is safe, socially-conscious, and incredibly durable. It is no longer made of materials that some may consider toxic. For the past 50 years, children’s dishware has been composed primarily of one material: melamine. Ironically, one of the active ingredients in this children’s tableware is formaldehyde. Melamine is formed by compressing the toxic material with melamine and an organic compound, using heat and pressure. The end result is one of the most durable plastics on the planet. Unfortunately, melamine dishware has been proven to leach chemicals into food and beverages for a variety of reasons. The major cause is heat. Melamine should never be microwaved (although people often do). It should not be exposed to acidic foods, and is also prone to leak chemicals with age. Overall, parents are realizing melamine simply isn’t a good option for their kids to be eating off of. So if melamine has been the popular choice for over 50 years, what are parents using now to compensate for the durable dinnerware? Perhaps one of the most popular substitutions to melamine is stainless steel. It shares the same level of durability, and cannot be smashed into pieces by an angry toddler. Stainless steel items are dishwasher safe, and some can even go in the microwave. Just because it is steel, does not mean it can’t be aesthetic. Children’s modern dishware made out of this material can be vibrant, fun, and colorful. Dishware made from wood spans far beyond the typical fork utensil you use to stir pasta. Humans have been eating out of wooden dishes for as long as we can remember. It is a pretty obvious assertion that you are never going to find chemicals in wooden dishware. One of the downsides to wooden dishes is that although they are elegantly crafted, rarely are they dishwasher or microwave safe. They must be washed by hand and dried immediately. Although it may seem strange to give a child a dish made from glass, the market has found a way to make them unbreakable. There are some products that are designed from tempered glass. Much like the windshield of a car, they are built to take a beating, and will not shatter on impact. Other styles are using silicone covers for a little extra protection. Ceramic is something that should be reserved for the older children, and will keep your kids eating off of something safe. These styles of plates are designed for the children that will not be throwing them on the ground. There are thousands of different pictures and designs that will have kids entertained, safe, and engaged during mealtime. Modern dishware for children that is made from silicone is heat resistant, safe, and easy to clean (just pop them in the dishwasher). It works beautifully in conjunction with other materials to create a greater level of durability. 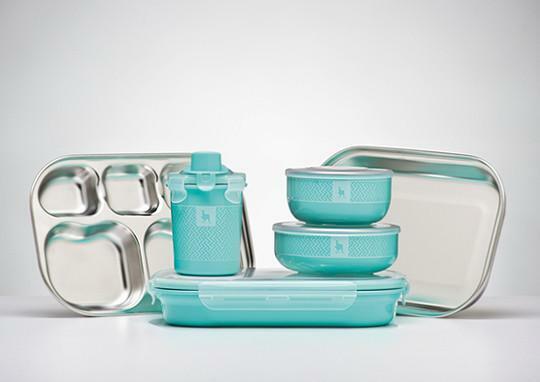 Although it seems unlikely, modern silicone dishware includes cups, bowls, and even storage containers. Another benefit is that silicone can literally go from the freezer, straight into the microwave. Silicone products will never crack or shatter. Part of what started the movement of parents looking for modern dishware for their children was the fear of BPA. Short for Bisphenol A, it is an industrial chemical that is used to make a mass amount of our plastic products in the world, including baby bottles and water bottles. Although there is some controversy surrounding the safety of the chemical, it is universally agreed upon that BPA mimics the function and structure of the hormone estrogen in the body. Excessive interaction of hormone levels within the body can lead to poor health. After 50 years, parents are starting to think on a safe and socially-conscious level when it comes to modern dishware for their children. It only makes sense that if a dish emits chemicals when exposed to a lot of normal processes (i.e. microwave, dishwasher, etc..) that it is probably not safe. Anything is better than plastic for the children. Each material has its own benefits. If you do not have a dishwasher, dishware that must be washed by hand may not bother you. Or perhaps you are simply too uncomfortable giving your child glass, in which case you can opt for the silicone dishware instead. Modern dishware does not imply fancy, rather it pushes for safety—a modernization our children can move into.